If you are looking for a healthy, quick, easy, delicious meal to serve your family, then look no further. (Unless of course you don’t like fish or are a vegetarian…in which case…um….keep looking). This meal takes less than 30 minutes and very, very little effort, but it still turns out with a delicious crunch and just the right amount of spiciness. I really love Cajun cooking. Some of the best food I’ve ever eaten has been at tiny little mom-and-pop restaurants in New Orleans. Outside of Louisiana, that type of food is not really abundant. There are a few restaurants I’ve found that serve some good ol’ gumbo, jambalaya, crawfish etouffe, and more, but I haven’t found many! 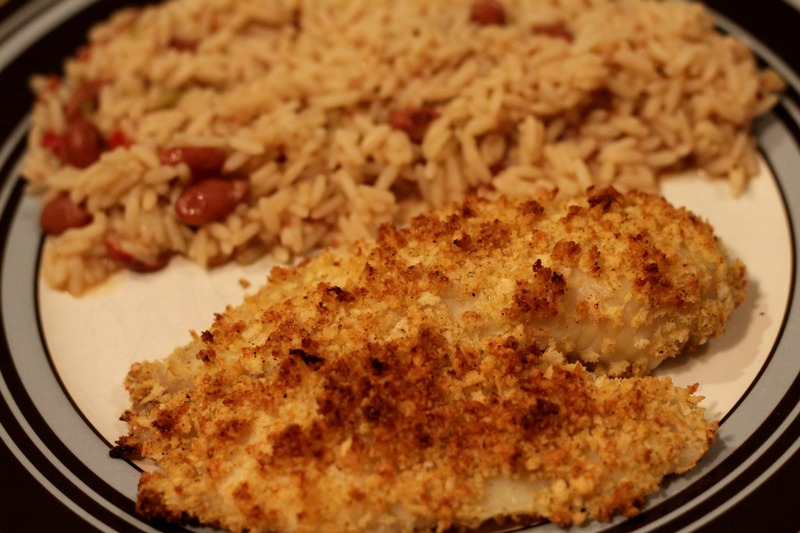 Now don’t get the impression that this tilapia recipe is as good as anything you’ll find in the bayou. But it’ll do for your average weeknight meal! As you can see, I served this with red beans and rice to continue with the Cajun theme, and it was perfect! Pour egg substitute into a shallow bowl. Combine breadcrumbs & seasonings in a separate shallow bowl. Dip each fillet in egg substitute and then dredge in crumb mixture, coating both sides. Place fillets on a sprayed baking sheet and bake for 10-12 minutes, or until flakey. We’ve been enjoying a lot of fish lately, some of it prepared just like this (except we still use a real egg, being fans of real food). Last night we even had rice and beans! We squeezed fresh lemon on top too, and thought it was a tasty addition. Love, love, love, fish! Oh I make fish at least once a week! It’s just so delicious and healthy! And by the way, I don’t use egg sub for eating plain (as in scrambled) But it works great for breading since you can’t taste it and it’s fewer calories and cholesterol. What a delicious addition to any menu! Cajun tilapia sounds so good right now Lindsay!